One of Chi Omega's six founding purposes was Campus Involvement, and is still a core value all sisters strive to participate in. You will find Chi O's in academic societies, in music and arts organizations, on sports teams, and part of extracurriculars of all kinds on the WPI campus. Campus Involvement comes in many other forms as well. Whether it's handing out Hershey's kisses to "kiss a senior goodbye", or partnering with other extracurricular and Greek organizations for activities, Campus Involvement helps form the strong bonds that make our campus so special. Check out some of the many great things we do in the community and on campus, and take a look at all of the activities we participate in! Work on Worcester day is a yearly event sponsored by the Interfraternity Council and the Panhellenic Council. Sisters and brothers of WPI Greek Life, as well as non-affiliated members of our school, volunteer a few hours of their day to partner with local service groups such as the Worcester Housing Authority, Habitat for Humanity, Friendly House, and Friends of Institute Park. Sisters participate in the yearly event hosted by Lambda Chi Alpha in support of their philanthropy, Grier Strong. Events include a relay race, a hammer smash, a catapult, and a lot of broken watermelons! 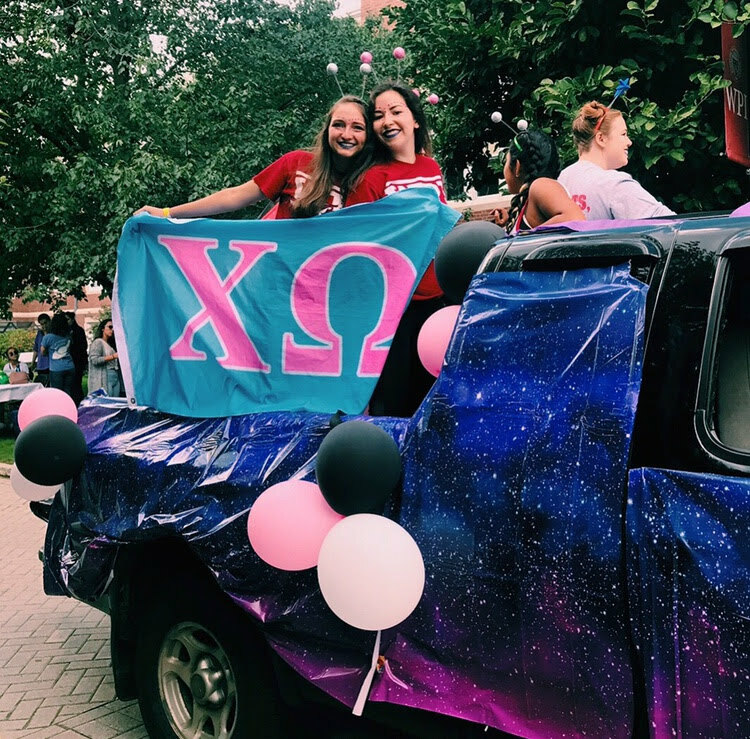 Along with the rest of WPI Greek life, Chi Omega makes a float every year for the annual Homecoming parade across campus. Additionally, we set up a table on campus to give out snacks and drinks to returning Alumni, their families, and students enjoying fall at WPI. Every Homecoming weekend, Alumnae sisters of our chapter are invited to brunch put on by their undergraduate sisters. What else are we up to on campus? Outside of sorority activities, you can find sisters cultivating their own interests in almost every type of extracurricular at WPI! The list below shows some of the many organizations sisters are involved in on campus. Bolded names are for organizations in which a sister is a member of the Executive Board.